What was the Missouri Compromise? In an effort to preserve the balance of power in Congress between slave and free states, the Missouri Compromise was passed in 1820, thus, admitting Missouri as a slave state and Maine as a free state (see Missouri Compromise of 1820: Transcription). Furthermore, with the exception of Missouri, this law prohibited slavery in the Louisiana Territory north of the 36° 30´ latitude line. In 1854, the Missouri Compromise was repealed by the Kansas-Nebraska Act of 1854. In 1857, the Missouri Compromise was declared unconstitutional by the United States Supreme Court in the Dred Scott decision, which ruled that Congress did not have the authority to prohibit slavery in the territories. Thomas Jefferson expressed his opinion regarding the Missouri Compromise in a letter to John Holmes dated April 22, 1820. Jefferson stated that the Missouri question, "Like a fire bell in the night, awakened and filled me with terror. I considered it at once as the knell of the Union." In a letter to William Short on April 13, 1820, Jefferson declared that the "Missouri question aroused and filled me with alarm...I have been among the most sanguine in believing that our Union would be of long duration. I now doubt it much." The Senate debated the admission of Maine and Missouri from February 8 through February 17, 1820. On February 16, the Senate agreed to unite the Maine and Missouri bills into one bill. The following day the Senate agreed to an amendment that prohibited slavery in the Louisiana Territory north of the 36° 30´ latitude line, except for Missouri, and then agreed to the final version of the bill by a vote of 24 to 20. However, after rejecting the Senate's version of the bill, the House of Representatives passed a bill on March 1, that admitted Missouri without slavery. On March 2, after a House-Senate conference agreed to the Senate's version, the House voted 90 to 87 to allow slavery in Missouri and then voted 134 to 42 to prohibit slavery in the Louisiana Territory north of the 36° 30´ latitude line. 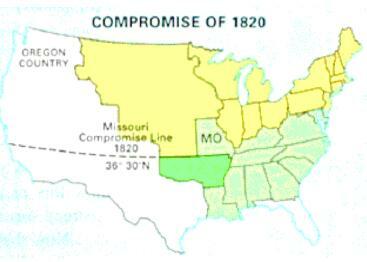 The Missouri Compromise was ratified by President James Monroe on March 6, 1820. See also: Missouri Civil War History and Kansas Civil War History. Although Missouri was allowed to join the union with slavery, Forbes observes, the compromise in fact closed off nearly all remaining federal territory to slavery. Forbes's analysis reveals a surprising national consensus against slavery a generation before the Civil War, which was fractured by the controversy over Missouri. "Great study...discusses the results and details of a powerful act that affected all Americans." The American Revolution set in motion the split between slave states and free states, but Mason explains that the divide took on greater importance in the early nineteenth century. He examines the partisan and geopolitical uses of slavery, the conflicts between free states and their slaveholding neighbors, and the political impact of African Americans across the country. Offering a full picture of the politics of slavery in the crucial years of the early republic, Mason demonstrates that partisans and patriots, slave and free—and not just abolitionists and advocates of slavery—should be considered important players in the politics of slavery in the United States. Sources: Fehrenbacher, Don E. The South and Three Sectional Crises. Baton Rouge: Louisiana State University Press, 1980; Moore, Glover. The Missouri Controversy, 1819-1821. Gloucester, Mass. : P. Smith, 1967; Shoemaker, Floyd Calvin. Missouri's Struggle for Statehood, 1804-1821. New York: Russell & Russell, 1969; Thomas Jefferson Papers from the Manuscript Division at the Library of Congress.